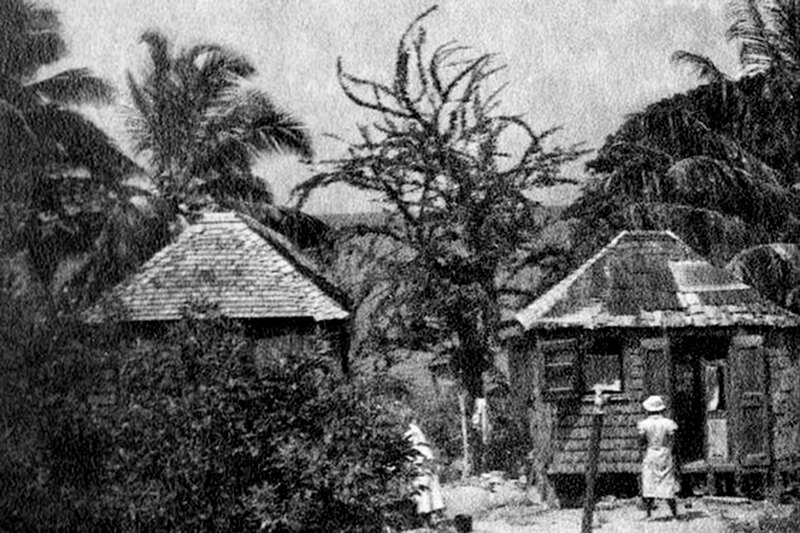 A calabash tree stands between to homes in a vintage Caribbean photo. The calabash tree has many uses, and is much loved in the Caribbean. We see them near homes in grainy old black and white photos. You can spot them on the roadside today, a tangle of green branches like leaf-covered whips. The fruit of the calabash has a hard skin that makes a sturdy and lightweight bowl or cup when it is dried. They were also used as vessels to carry water. Throw some hard seeds inside and you can make them into musical shakers. Designs carved into the wet skin of a fresh fruit are preserved in the dried shell, and many calabash objects feature intricate designs. 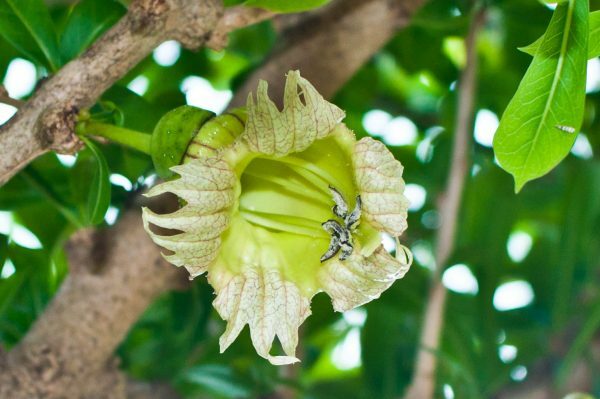 The calabash flower is pollinated by bats. The pulp of the fruit is not particularly appetizing, but in some places foods or drinks are made with very young fruit, pulp or seeds. In Curacao, the seeds are used to make a candy called carabobo. Preparations of the fruit are also used as remedies for cough, asthma and other conditions. Although the calabash tree is not very tall or straight, the hard wood was used for tool handles, saddles and some furniture. In times of drought, calabash branches were cut down so livestock could eat the leaves. The calabash tree is also a part of many cultures. In one folk tale, the trickster Anancy gathers all the common sense in the world into a calabash. (Spoiler alert: the calabash falls and the common sense scatters, which is why we all have a little of it today.) Some believe calabash trees shelter spirits, and in some parts of the Caribbean they were planted near graves. Some of the uses and cultural connections to the Caribbean calabash tree can be traced back to the calabash vine or bottle gourd in Africa. Although the tree and the vine are not related to each other, their fruits are used in many of the same ways. African traditions—transformed and adapted to the New World—are central part of Caribbean culture. 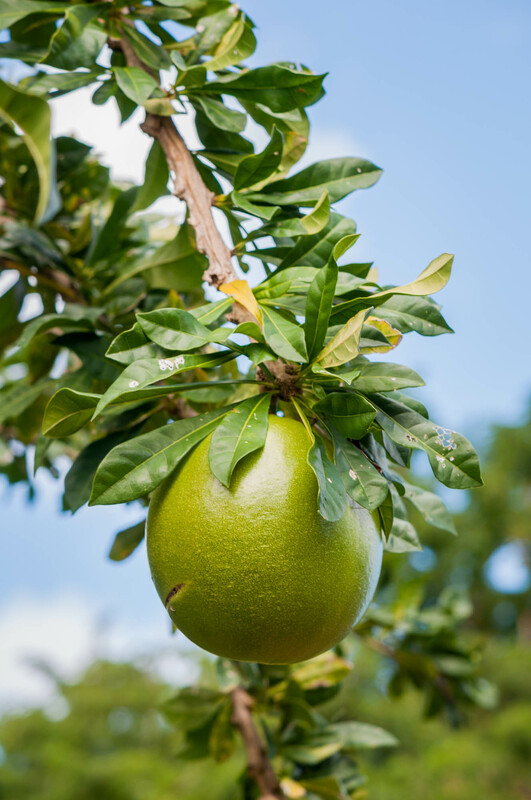 The calabash tree is a great example of how these traditions adapt and persevere. How do you use the calabash tree? Tell us by writing in to The Daily Herald or to info@lesfruitsdemer.com. 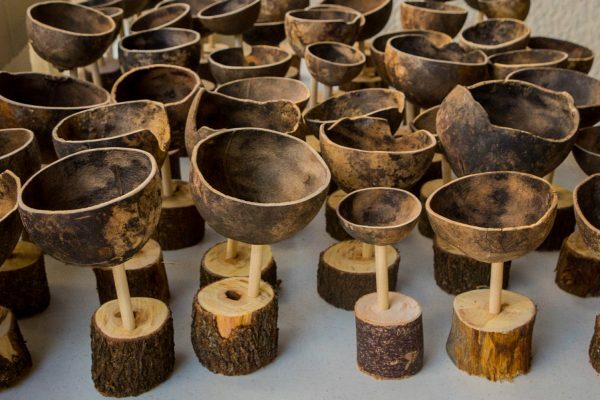 Bird feeders made from calabash.